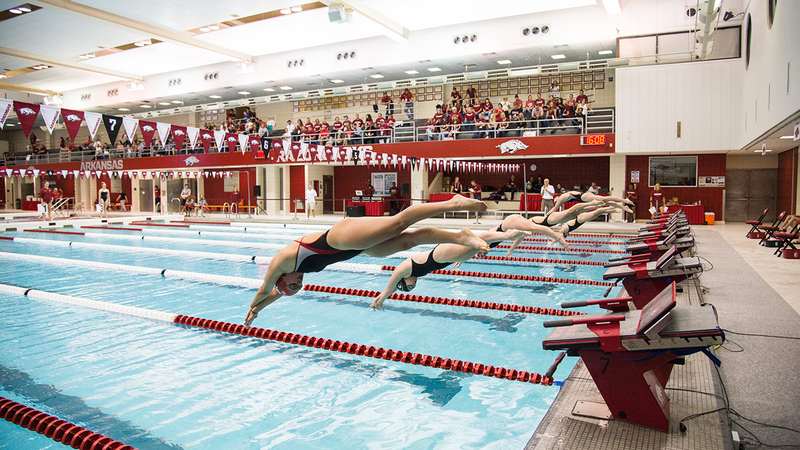 FAYETTEVILLE, Ark.- Arkansas swimming and diving head coach Neil Harper announced the addition of nine incoming freshmen to the 2019-20 roster Wednesday afternoon. Harper’s third recruiting class since becoming head coach will include two divers and seven swimmers. Jessie Beckwith | Flyer | Castle Rock, Colo. Four-year letter winner at Rock Canyon High School, where she was named team captain and also served as the manager for the boys swim team … Helped lead the Jaguars to four-consecutive A League Swimming Championship … 2016 finalist in the 50 free and 100 fly at the 5A State Championships … Placed fourth in the 100 fly and ninth in the 50 free at the 2017 5A State Championships … Placed ninth in the 50 free and sixth in the 100 fly a the 5A State Championships in 2018 … Also swam for club team Denver University Hilltoppers where she competed in the 2017 Winter Junior Nationals and the 2016, 2017, 2018, and 2019 Sectionals. Four-year letter winner at Rockwall High School, where she swam with fellow Razorback Janelle Hummingbird … Helped lead the Yellowjackets to three district championships, where she placed fourth in the 200 free in 2016 … Currently holds the school records in the 200 free, 200 medley relay, and the 400 free relay. Four-year letter winner at Rockwall High School, where she swam with fellow Razorback Emma Hultquist … Also lettered in water polo … USA Swimming Academic All-American … Helped lead the Yellowjackets to three district championships … Placed third at the North Texas TISCA in 2018, and in 2017 placed fourth at the North Texas TISCA and fifth in regionals … Three-time state swimming qualifier … Placed first in the 100 back at regionals in 2018 … Holds the school record in the 200 medley relay and the 400 free relay … Swam for club team Rockwall Aquatics Center of Excellence where she competed in the Junior Winter Nationals for three years … Three-time junior Olympics player in water polo, and also participated in the water polo Olympic Development Program. Four-year letter winner at La Cueva High School … Helped lead the Bears to a 2016 State Championship and back-to-back second-place finishes at state … Had the best times in the 50 and 100 free her freshman year, when she also broke the 200 medley relay record … Swam for club team Charger Aquatics, where she was a Junior Qualifier … Swam in the Western Zones, the Speedo Sectionals, and Winter Juniors … Scholastic All-American and Academic All-American. Maddie London | Breastroker | Collierville, Tenn. Four-year letter winner at Collierville High School … Also lettered in volleyball … Helped lead the Dragons to three co-ed and women’s team championships … Placed fifth in state on the co-ed team … Broke the county record in the 200 free relay her sophomore year … County champion in the 50 free and 100 breast her junior year … 2018 All-Metro Female Swimmer of the Year finalist … Holds the school records for the 50 free, 100 breast, 200 free relay, and 400 free relay … Swam for club team Memphis Thunder Aquatic Club where she competed in the Southeasterns LCM and SCY Championships from 2016-18, as well as competed in the 2018 USA Swimming Futures Championships. Josephine Matalone | Diving | Fayetteville, Ark. Three-year letter winner at Haas Hall Academy … Helped lead the Mastiffs to state championships her sophomore and junior years … Was a state runner-up in the 1 meter her sophomore year and was the state champion in the 1 meter her junior year … Was also a level 9 gymnast … Dove for club team Hawg Diving Club. Allie Rogers | IM Specialist | Conway, Ark. Three-year letter winner at Conway High School, where she was a Scholastic All-American … Helped lead the Wampus Cats to three second-place finishes, and earned All-State twice … Swam club for Hendrix Aquakids, where she competed in Junior Nationals and Sectionals. Four-year letter winner in swimming and two-year letter winner in track at West Des Moines Valley High School … Helped lead the Tigers to a sixth-place finish at state in 2016, an eighth-place finish in 2017, a 12th place finish in 2018, and an 11th place finish in 2019 … Placed fourth in the 200 free relay and was named Second-Team All-State her freshman year … Placed fourth and was an Automatic All-American in the 50 free, as well as being named Second-Team All-State her sophomore year … Placed second in the 100 fly as well as third and was an Automatic All-American in the 50 free her junior year, earning First-Team All-State … Finished third in the 100 fly, was named First-Team and Senior-Team All-State, and earned an All-American Consideration in the 50 free … Swam club for Dowling Catholic Riptide, where she earned two championships and six podium finishes.